Most of you are aware of that I have a very sensitive skin and I refrain from using just about anything and everything on my face. I never use any face cream or moisturiser, scrub or anything until I'm sure about it. 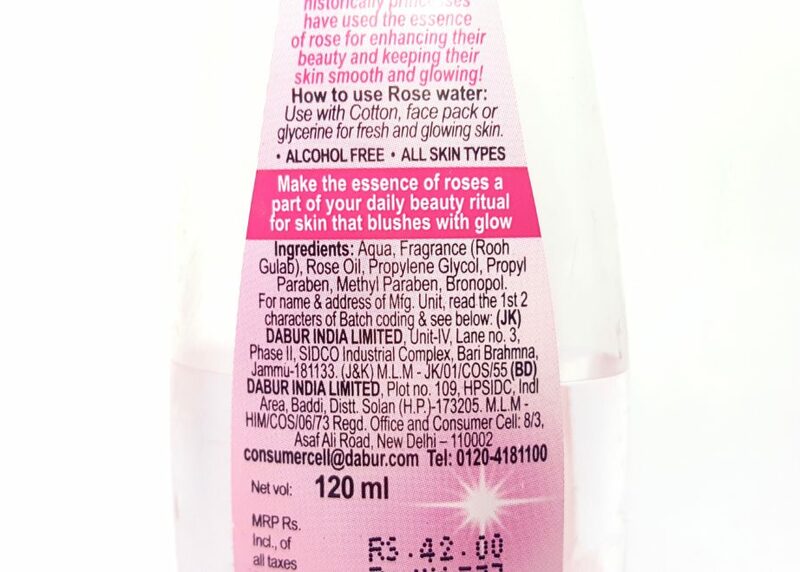 When I got to know that Dabur Gulabari rosewater is loaded with chemicals and parabens, I was shocked. Something which is supposed to be herbal should not have such a long list of chemicals in it. On the other hand, Manav Khadi Herbal rose water is quite different. For all those who are unable to believe the fact that Dabur Gulabari is not pure or 'Just rosewater', here is an image of the ingredients present in it. You can clearly see how many chemicals are present in this supposedly pure herbal product. I have even used it in food as well while making gulab jamun and fragrant rice. 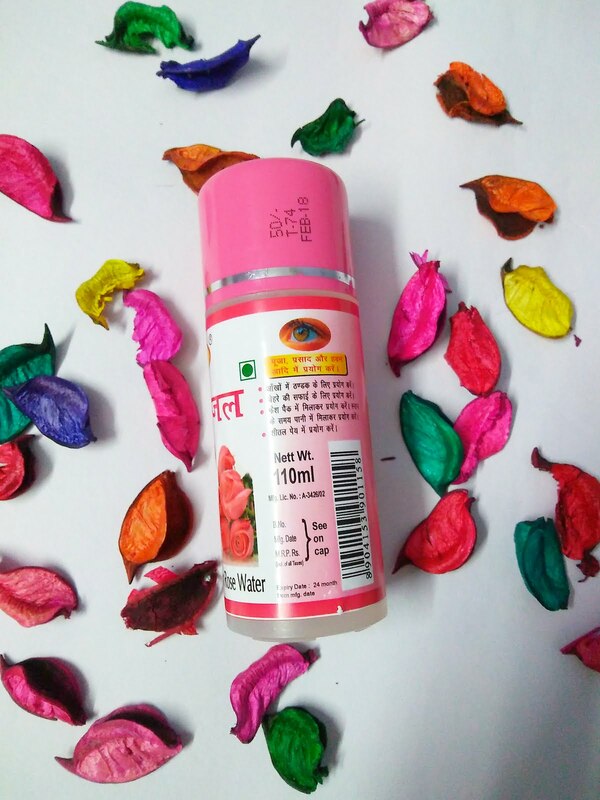 Getting back to Manav Khadi Herbal rose water, Let's review my new favourite rose water. 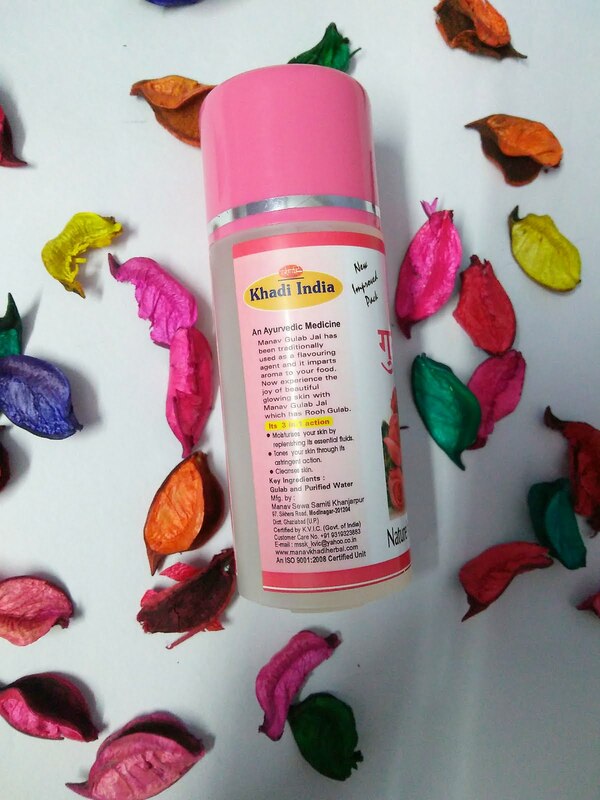 Manav Khadi Herbal rose water is from Khadi Gramodyog, which is known for its handmade herbal products. Manav Gulab Jal has been traditionally used as a flavouring agent and it imparts aroma to your food. 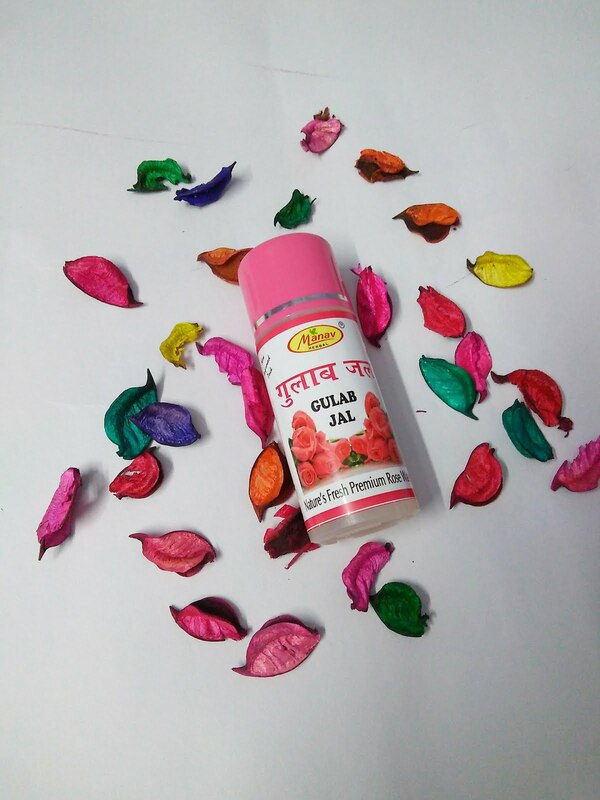 Now experience the joy of beautiful glowing skin with Manav Gulab jal which has Rooh Gulab. Moisturises your skin by replenishing its essential fluids. 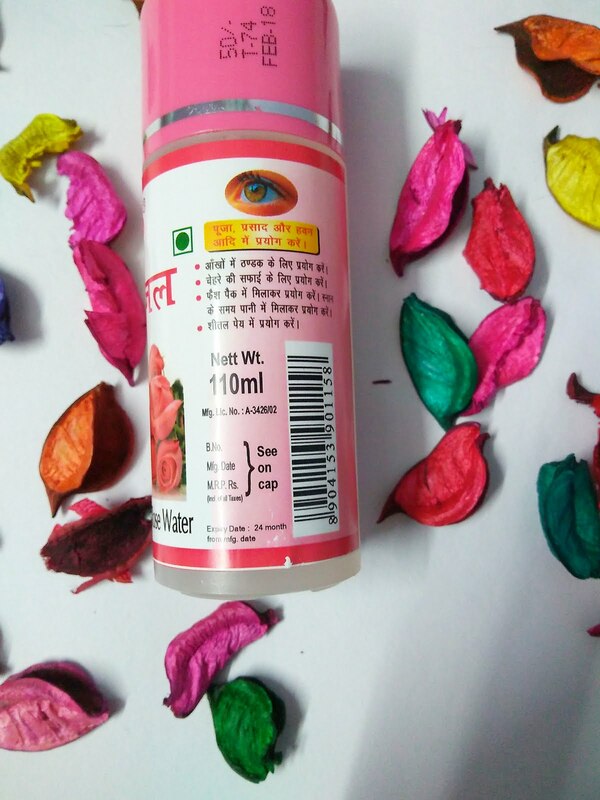 The brand offers two types of rose waters, one for toning purpose and the other for general usage (eye drops, eating, drinking and skin care). Manav Khadi Herbal rose water is the later one, which is safe to consume. If it is safe to be eaten, I suppose it will be good for the skin as well. Let's find out more. Just two ingredients, that's it. Put few drops in your eyes for cooling them after a stressful day. Cleanse and tone your skin by dipping a cotton swab in rose water and wiping facial skin with it. Add a few drops to face pack or bathing water for that rosy glow. Make a Rose drink using this herbal rose water. First, let's talk about the fragrance. 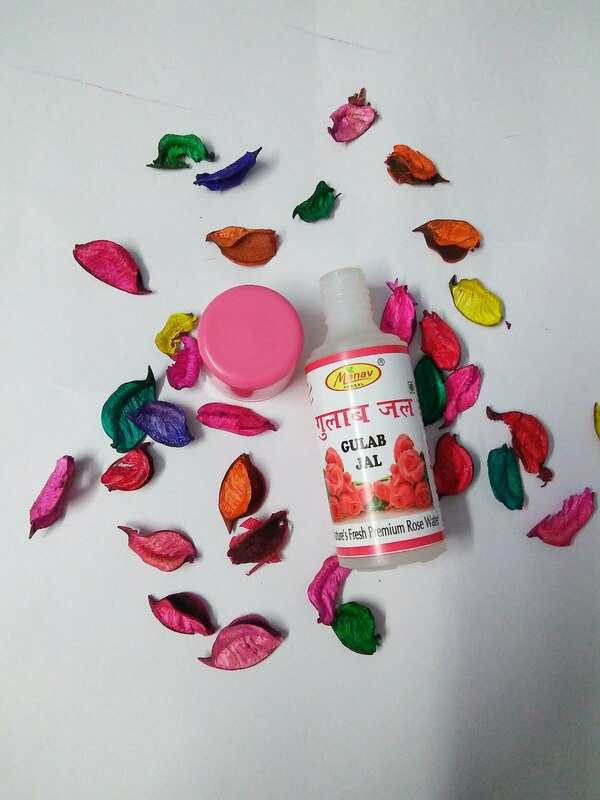 It is not as amazing as it was in Dabur Gulabari (coz they used perfume and not real roses). However, it is not artificial so you will love it. It is basically clear liquid, but I did find some bits and pieces of rose petals ( very minute). I filled my face spray bottle with it, after cleaning it with distilled water. It really helps me to feel fresh, removing all the dirt and oil. I also use it while making steamed rice or biryani and in my face pack. I can see a visible difference on my face. My skin has become very plump and looks fresh even on a hot day. Packaging is pretty simple just like rest of the Khadi products. It comes in a translucent plastic bottle with pink cap. You will have to pierce it open using a clean needle or safety pin. The bottle is quite travel-friendly! Multipurpose, you can eat it, drink it and use on your skin. Not that easily available. I bought from Khadi shop in Chandni Chowk, couldn't find it online or any local stores. I really loved this rose water and I will suggest you try it. The price is not much, so you should try it at least once. Do tell me your views on this. Have you tried it? Tell me about your expereince in the comments below.